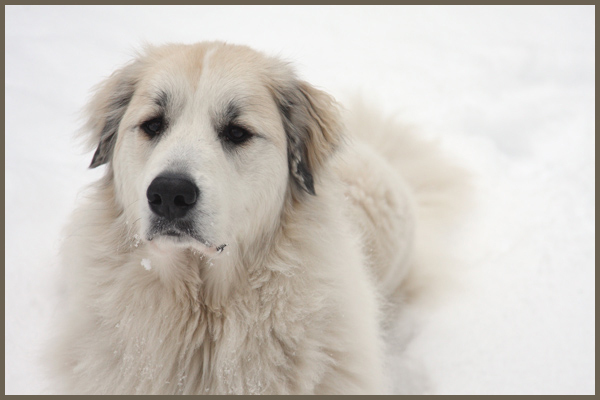 Alta Colina's Hissige Hedvig "Noor"
After the death of Lot it is clear to us that we only want a Pyrenean mountain dog. Initially we are looking for a suitable rescue dog. There are a few but they find a new home (fortunately for them) before we can see them. We have never known Lot as a puppy so we really would like to have a puppy this time. We go to two Dutch breeders namely La Joie Blanche and MacThree. We are introduced to them both and to their dogs and we have a lot of confidence in both breeders. It will be some time before the puppies are born and that gives us time to overcome the death of Lot and open up to a new dog. But unfortunately it is not going well with the matings and pregnancies and we have the date for the arrival of a puppy repeatedly postponed. In October, we feel that we have waited enough. Then we decide to look across the border and so we arrive at kennel Alta Colina in Norway where two litters are born. At the first meeting in November, the decision was made that H4 would go live with us. That's how we got to know her: H4. Later she gets the official name Hissige Hedvig. That means Fiery Hedwig, because in the litter she is already a strong personality. Of course because she was born a Norwegian. And in Arabic it means "light" and therefore she is our Northern light.